In his earliest literary efforts, Plato tried to convey the spirit of Socrates's teaching by presenting accurate reports of the master's conversational interactions, for which these dialogues are our primary source of information. Early dialogues are typically devoted to investigation of a single issue, about which a conclusive result is rarely achieved. Thus, the Ευθυφρων ( Euthyphro ) raises a significant doubt about whether morally right action can be defined in terms of divine approval by pointing out a significant dilemma about any appeal to authority in defence of moral judgments. The Απολογημα ( Apology ) offers a description of the philosophical life as Socrates presented it in his own defense before the Athenian jury. 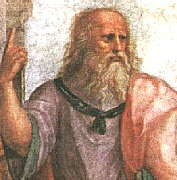 The Κριτων ( Crito ) uses the circumstances of Socrates's imprisonment to ask whether an individual citizen is ever justified in refusing to obey the state. Although they continue to use the talkative Socrates as a fictional character, the middle dialogues of Plato develop, express, and defend his own, more firmly established, conclusions about central philosophical issues. Beginning with the Μενων ( Meno ), for example, Plato not only reports the Socratic notion that no one knowingly does wrong, but also introduces the doctrine of recollection in an attempt to discover whether or not virtue can be taught. The Φαιδων ( Phaedo ) continues development of Platonic notions by presenting the doctrine of the Forms in support of a series of arguments that claim to demonstrate the immortality of the human soul. The masterpiece among the middle dialogues is Plato's Πολιτεια ( Republic ). It begins with a Socratic conversation about the nature of justice but proceeds directly to an extended discussion of the virtues (Gk. αρετη [aretê]) of justice (Gk. δικαιωσυνη [dikaiôsunê]), wisdom (Gk. σοφια [sophía]), courage (Gk. ανδρεια [andreia]), and moderation (Gk. σωφρσυνη [sophrosúnê]) as they appear both in individual human beings and in society as a whole. This plan for the ideal society or person requires detailed accounts of human knowledge and of the kind of educational program by which it may be achieved by men and women alike, captured in a powerful image of the possibilities for human life in the allegory of the cave. The dialogue concludes with a review of various forms of government, an explicit description of the ideal state, in which only philosophers are fit to rule, and an attempt to show that justice is better than injustice. Among the other dialogues of this period are Plato's treatments of human emotion in general and of love in particular in the Φαιδρος ( Phaedrus ) and Συμποσιον ( Symposium ). Plato's later writings often modify or completely abandon the formal structure of dialogue. They include a critical examination of the theory of forms in Παρμενιδης ( Parmenides ), an extended discussion of the problem of knowledge in Θεαιτητοσ ( Theaetetus ), cosmological speculations in Τιμαιος (Timaeus), and an interminable treatment of government in the unfinished Λεγεις ( Laws ). Plato's middle period metaphysics and epistemology by Allan Silverman. Plato's ethics by Dorothea Frede. Plato's ethics and politics in The Republic by Eric Brown. Bernard Suzanne's alternative interpretation of Plato and his dialogues. William Turner's article in The Catholic Encyclopedia. A literary analysis of Plato's work in The Perseus Encyclopedia. Eric Weisstein's discussion at World of Scientific Biography. Discussion of Plato's mathematical thought at Mathematical MacTutor.